I graduated from River East Collegiate in Winnipeg in 2014 and was accepted to the Brandon University School of Music to study both flute and saxophone. In the fall of 2014, I began my degree, after which I entered the concurrent music education stream in the spring of 2015. Upon completion of my degree in May 2019, I will be graduating with a Bachelor of music and a Bachelor of Education with a minor in history. During my time at BU, I am very proud of the scholarships and awards I have received. This includes the Carl & Lyle Sanders Scholarships in Music in 2014, and the Shirley Craig Scholarship in Music in 2015, 2016, 2017, 2018. Another source of pride is being placed on the Dean’s Honour Lists each year and being inducted into the President’s Honour Society last spring. Another aspect of my education I am proud of is my pursuit of jazz and flute studies in addition to my saxophone major. My flute studies have continued through my private lessons with Nancy Hennen. Jazz studies have included Introduction to Jazz Improvisation and Jazz History. Performance opportunities have included Jazz Small Groups and membership in the BU Big Band for four years. International performances include the Market Street Brass in North Carolina in December 2017. In the Spring of 2018, I performed a recital that featured both my flute and saxophone playing. I am also proud to have sat on the Brandon University Student Music Educators Association Council as Fundraising Chair from 2015-2017. Lastly, I presented my research in Demonology at the 2017 Brandon University Senior Colloquium. I am the youngest sibling and I have one brother. My family resided in a small community northeast of Winnipeg, called Cooks Creek. I was kept busy with all sorts of activities, including soccer, dance, baton, swimming, and music. We were very fortunate to have the opportunity to travel a great deal as children, and to this day I enjoy visiting and experiencing new countries and cultures. Travel has helped mold me into the person I have become. Most recently we visited five different countries in Africa including Rwanda, Uganda, Tanzania, Botswana, and South Africa. Some of my hobbies include snowboarding, scuba diving, reading, and spending time with family and friends and also with my dog, Aspen. For as long as I can remember I have loved music. I started taking piano lessons when I was seven years old, and in elementary school I sought out every opportunity to spend time in the music room. Studying Music Education piqued my interest in middle school, when I started playing flute and developed a love for band and I have been hooked on it ever since. My interest only deepened in high school when I started playing saxophone and took more of an interest in jazz. I love music, including sharing it with people through performing and teaching. Throughout my music education I have been inspired by so many amazing teachers, including Taylor Schmidt, Jeff Kula, Haley Rempel, Greg Gatien, Nancy Hennen, Dr. Mathew Steckler, Michael Cain, Dr. Wendy McCallum, and Dr. Sheelagh Chadwick. I don’t know that I would call it a philosophy, but in life I have come to value resilience. To me, to be resilient is to have the courage to try something you’re scared of. Even if you fail you can pick up the pieces and start again, but you won’t know unless you try. After graduation, I hope to secure a job teaching Music. I am also excited to find opportunities to travel and explore new cultures, while putting my degree to good use. In time, I would like to pursue a master’s degree in Music Performance or Music Education. I am very excited to meet my future students and see what life as a music educator has in store. 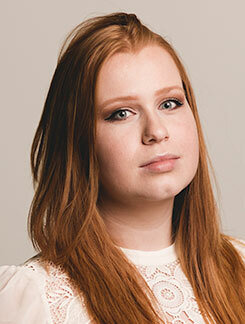 I would like to nominate Maria Andersson who is a 5th year student in the concurrent music and education degree.